(Bloomberg) -- Lagos stocks extended their winning streak to the longest since July 2017 before this weekend’s election, as investors stepped up their bets on a market-pleasing outcome. The benchmark Nigerian Stock Exchange Main-Board Index climbed 2.1 percent Tuesday, its best performance this year, rising for an eighth consecutive day to the highest in almost four months. Dangote Flour Mills Plc, Jaiz Bank Plc, Livestock Feeds Plc and NPF Microfinance Bank Plc all rose by the 10 percent daily limit. The Feb. 16 vote is tipped to be a close contest between the two strongest candidates: President Muhammadu Buhari and Atiku Abubakar, a successful businessman and former vice president who promises to pursue more market-friendly policies. Investors may be positioning for an Atiku win, said Olabisi Ayodeji, an analyst at Exotix Capital. The perception among foreign investors is that Abubakar brings greater prospects for improved management of an economy that vies with South Africa to be the continent’s largest, said Ayodeji. “If Atiku wins, the market should perform better after the elections.” Conversely, a Buhari victory may prompt a negative reaction in stocks, she said. Citigroup Inc. analysts have also said Nigeria’s stock market may rally if Buhari loses. The incumbent has fallen short on meeting pledges to rejuvenate and diversify the oil-dependent economy and had mixed success in quelling rampant corruption in four years in office. Abubakar has pledged to privatize state assets and float the naira, but has faced accusations of corruption that he has denied. Even after their recent gains, Nigerian stocks trade at lower valuations to frontier market peers: 7.6 times estimated earnings, compared with more than 11 times for members of the MSCI Frontier Markets Index. 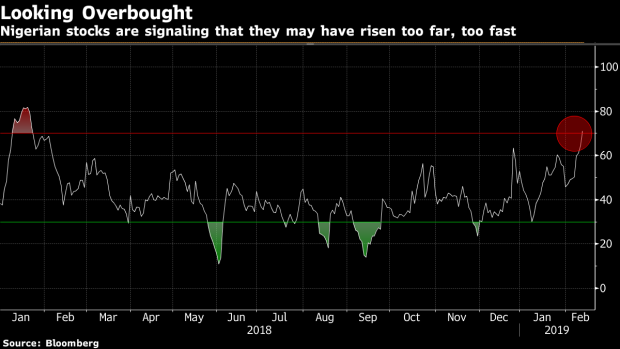 But, in a technical sign that the stocks benchmark may have risen too far, too quickly, its 14-day relative strength index closed above 70 Tuesday, finishing in “overbought” territory for the first time in more than a year.